A true great has passed. Aretha Franklin, “Queen of Soul,” had long been ill and on August 16, 2018, she succumbed to complications of advanced pancreatic cancer while in hospice care at her Detroit home, according to her family. The beloved performer leaves an iconic legacy instrumental in changing popular music the world over. Her early issues on Atlantic Records in the late 1960s and early 1970s, along with those of such fellow musical giants as Ray Charles, Wilson Pickett, and Sam and Dave, spurred the onset of popularized soul music. Memphis-born Aretha Louise Franklin began her career at age 10 in the gospel choir of Detroit’s New Bethel Baptist Church where her father, C. L. Franklin, was a minister. 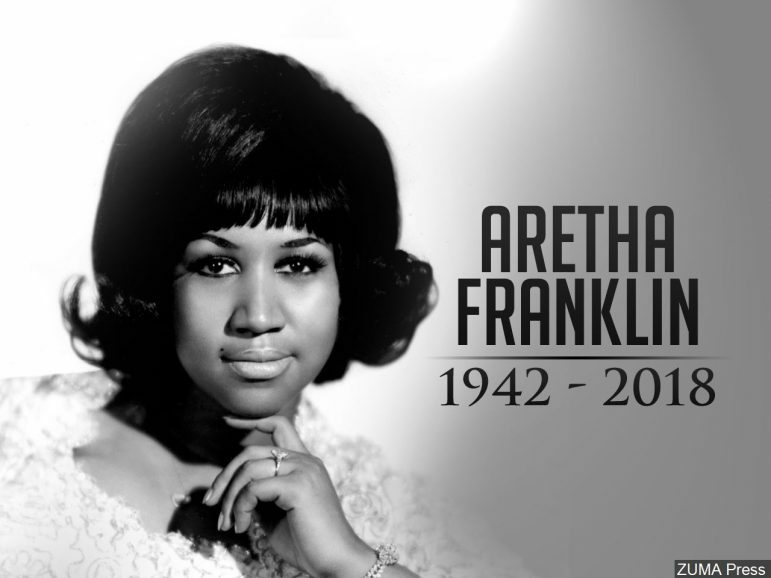 Four years later, as manager, he took her on church tours and helped sign her to JVB/Battle Records for Aretha’s 1956 recording debut Songs of Faith, releasing the singles “Never Grow Old” and the standard “Precious Lord, Take My Hand” to gospel radio stations. Young Aretha occasionally traveled with The Soul Stirrers featuring eventual soul star Sam Cooke. Moving to Columbia Records at 18 and switching to secular music, Franklin tried various styles, including jazz, blues, and doo-wop, recording Aretha: with the Ray Bryant Combo, The Electrifying Aretha Franklin and The Tender, the Moving, the Swinging Aretha Franklin. Other tunesmiths she covered over the years included Bobby Womack (“I’m In Love”), Don Covay (“Chain of Fools”) and the team of Carole King and Gerry Goffin (“You Make Feel Like A Natural Woman”). With more than 20 number-one hits, she became the most- charted female artist in Billboard’s history. A gifted songsmith in her own right, Aretha Franklin originals included “Day Dreaming,” “Think” and “Rock Steady.” Her legendary career was cemented with Spirit in the Dark, Young, Gifted & Black and the gospel album, Amazing Grace, which topped two million in sales. Commercial success returned with a veritable vengeance in the mid-’80s as Jump to It and Who’s Zoomin’ Who? went platinum. Spanning six decades, Aretha garnered 18 Grammy Awards, charted 112 singles and sold more than 75 million records. She performed at the presidential inaugurations of Jimmy Carter, Bill Clinton, and Barack Obama as well as at the Royal Albert Hall before Queen Elizabeth. Aretha became the first woman inducted to the Rock and Roll Hall of Fame in 1987 and was also inducted to the UK Music Hall of Fame and the GMA Gospel Music Hall of Fame. Though not a public activist, on the arrest of Angela Davis, Aretha Franklin posted her bond, saying, “Angela Davis must go free. Black people will be free. I’ve been locked up and I know you got to disturb the peace when you can’t get no peace. Jail is hell to be in.” She also sang at the memorial service for civil rights immortal, her friend Dr. Rev. Martin Luther King, Jr.
Aretha Franklin dealt with health issues for years. In 2010, she canceled several concerts after undergoing surgery for a tumor. Following a 2011 comeback at the Chicago Theatre, 2013 saw an increasing deterioration of health intermittently marked by canceled performances. Her final tour was in June 2014, kicked off with a show at Radio City Music Hall. Last year, health concerns scuttled a series of concerts before what would be her last live performances at the Wolf Trap in Virginia and NYC’s Cathedral of Saint John the Divine, for the Elton John AIDS Foundation. As news of her passing spread, condolences and reflections of Aretha’s legendary career poured in from artists and fans all over the world. Jennifer Hudson has been confirmed to portray Aretha Franklin in an upcoming biography with music mogul Clive Davis executive producing. Davis also has confirmed a November tribute at Madison Square Garden. A private funeral for family and friends of Aretha Franklin will be held Aug. 31 in her hometown of Detroit. Public viewings will take place Aug. 28-29 at the Charles H. Wright Museum of African American History from 9 am to 9 pm, also in Detroit.